In case you haven’t heard, there is a new life organization trend taking the world by storm, and the revolution is being led by a woman named Marie Kondo. Kondo is a Japanese organizing consultant and author who has written four books on organizing that have been translated and sold worldwide. Additionally, Netflix recently released Tidying Up with Marie Kondo, a series where she helps people declutter their homes, and essentially their lives. It seems like she is everywhere these days! The KonMari method, in short, is all about minimizing, and it focuses on how our belongings shape the overall picture of our lives. The core principle is to remove physical items that don’t spark joy. If it’s not actively making you happy, thank it for its time and say your goodbyes. When only your joy-giving belongings remain, put them in areas that are visible and easy to grab so the housekeeping stays minimal. In the end, it’s about creating a space that makes you feel grateful and relaxed. As a business owner and mom, it can be a challenge to meet the demands of each and every day. I read Marie’s book, The Life-Changing Magic of Tidying Up, and wanted to do everything she suggested, but I felt overwhelmed. How was I supposed to make the time to magically declutter my whole life? I had my doubts, but there was something about the KonMari method that “sparked” something in me. After finally giving it a shot, I want to share some of my favorite takeaways from the KonMari method. This is a big one, and it’s something that sets her method apart from others. I had never thought of tackling organizing this way before. Previously, I would always sort through the kitchen then the dining room and continued room by room. The KonMari method insists that you declutter category by category so you can see everything in one glance and don’t end up just pushing things to a different place. And of course, she has an order to her method so that it’s easy to know where to start. This particular order allows you to more easily hone in and take inventory of all you have. While going through the categories, you will find yourself getting better and better at finding what it really means for an item to spark joy in your life. When you do get to the last step, sentimental items, you can make more intentional choices during what can be an emotional time. The KonMari method adopts an element of animism learned in Japanese culture, which is that every object has a soul. 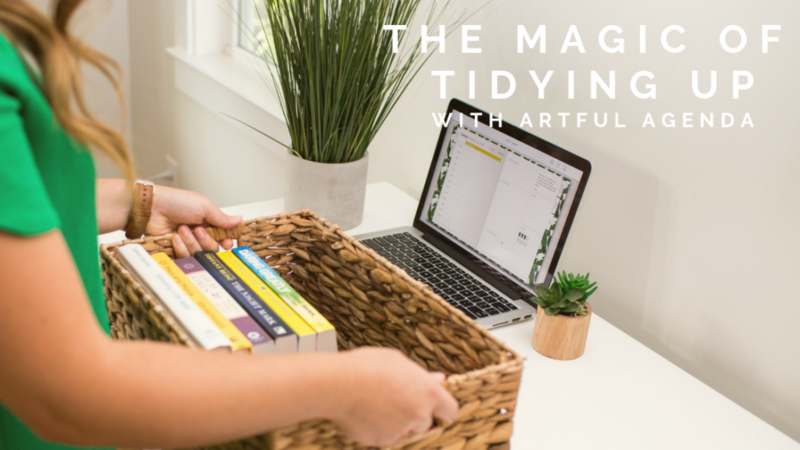 It might seem a little out there to those unfamiliar with the idea, but it can help you shift your mindset during the decluttering process. It allows you to more clearly see which items are not getting the attention that they need and make the decision to let them go. When it comes to emotional belongings, saying goodbye to each item and thanking it for its service can help you move on with closure. By respecting your belongings when you say goodbye, you also learn to appreciating all you do have going forward. This might be a scary thought… but it’s how the method works. For example, she suggests you gather all your clothes and make a pile of them in the same place. Seeing a giant pile gives you perspective on all the things you have and makes it easier to identify things that you no longer love. The result is that you have decluttered first so when you go back to organize, your priorities have shifted. It really is a different take than the usual thought process behind cleaning. Before, I felt like I was organizing everything from highest priority to lowest when in actuality I shouldn’t have even been keeping unused things at all! Marie Kondo believes that you should only be surrounding yourself with things that “spark joy”. That sounds nice, but how do you know if a belonging sparks joy? To figure this out, she recommends physically holding the item in your hand, closing your eyes, and embracing the feeling it gives you. As strange as this sounds, it takes you out of the mindset of keeping something just because it’s practical or you might need it. It’s a way to ensure that you surround yourself with only belongings that will bring you happiness. Kondo advocates that everything you own needs to have a place: a place to be found and a place to return back to. This makes it much easier to maintain a clean living space after the process is over. It also ensures that items that you use often will be in an accessible and easy-to-reach spot. If you have something that is important to you, but you don’t use it often, make sure it’s clearly visible so that it can get love and spark joy often. When you declutter your life, you will inevitably rediscover forgotten treasures amongst the mess. It made me happy to give items like this a new home so I could actually remember to use them. If you know my story, you know that I’m pretty in love with planning. After all, that’s why I created Artful Agenda. Keeping up with all the things going on in my life wouldn’t be possible without it! ✓ Rid of all the clothes that aren’t sparking joy in my life and reorganize them in a way that makes sense. ✓ Winter week! Sort, donate and reorganize all winter clothing. Remember to be flexible and set realistic expectations for yourself. Planning months ahead of time might seem overwhelming at first, but it’s the best way to start! If those aren’t exactly the days everything gets done, simply snooze or drag tasks and double up the next! When it’s on your calendar and you make it a priority, you will be much more likely to hold yourself accountable. Trust me, the future you will thank you. If you take on this challenge, I wish you all the best! I hope it truly does make a magical change in your life. Don’t have an Artful Agenda account?